Maxie Cooper's art exhibition, Now Showing, reels back in tribute to her movie mogul father Keki Modi and the golden cinema years he brought Bombay. How I longed to revisit the hall, witness to me weep buckets in the dark. Watching schmaltzy flicks like Love Story, which told smitten teens love means never having to say you're sorry (absurd advice, we soon realised) and left girls pining equally for Ryan O'Neal's baby face and Ali MacGraw's thick eyebrows. So I walked through the deserted yet stunning New Empire within days of its closure, with owners Maxie and Burge Cooper, delighting in the theatre's vintage machines and Deco design bands cemented on the proscenium. 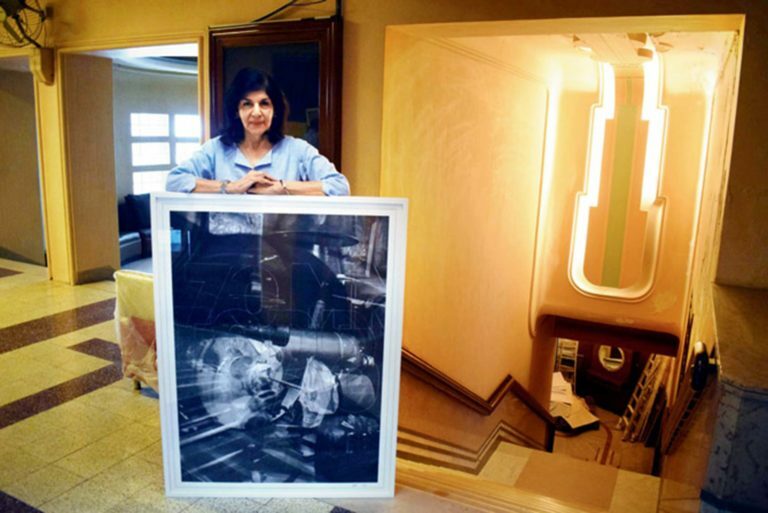 Painter-photographer Maxie is the daughter of movie mogul Keki Modi (whose South Bombay properties were New Empire, Excelsior and Strand), younger brother of legendary actor-director-producer Sohrab Modi. I couldn't miss noticing the final film's tagline, "Seize your glory", smite a third blow. Gone for good were the glory years of a structural gem that switched avatars graciously. Built on Victorian Baroque lines, Empire welcomed audiences to gala live performances in 1908. Modi bought the Bombay Improvement Trust-owned Empire in 1935, prefixing "New" to Empire some years after. Asia's first theatre with a cantilevered balcony underwent a 1948 overhaul in the prevalent Art Deco style. 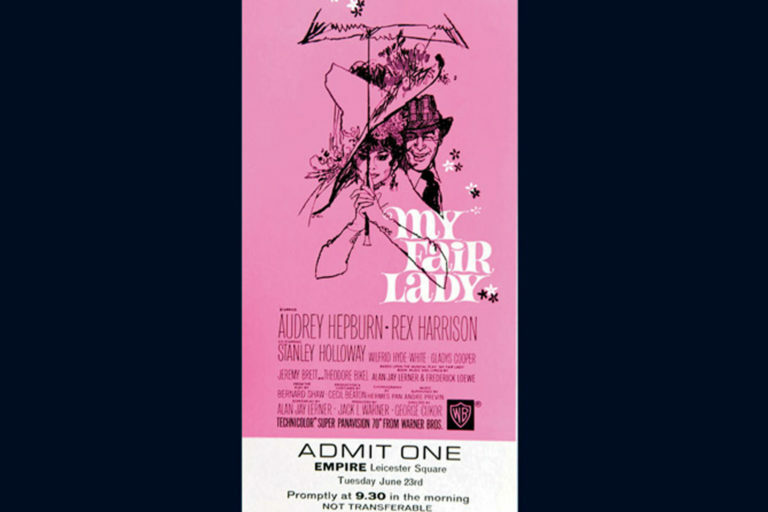 Invitation to Keki Modi's family for the June 1964 premiere of producer Jack Warner's My Fair Lady, at Empire Cinema in Leicester Square, London. Maxie Cooper treasures a personal card from Warner to "Luncheon in Lancaster Room, Savoy Hotel following the first European screening of My Fair Lady"
I'm back at New Empire this month, where Maxie readies an intriguing collection of works for her exhibition titled Now Showing. Opening on September 2 at Rukshaan Art Gallery, Lion Gate, this is an intended tribute to her father and the heady mid 20th-century Hollywood magic he brought the city. "Coming from a family associated with cinema before I was born, I've grown up steeped in it, fortunate to see the last decades of its golden age," Maxie says. Her earliest memories are of inviting friends to Sunday morning screenings of children's films at their Central Studios preview theatre in Tardeo. Now Showing presents an evocative set of abstract prints, segueing Maxie's unusually angled photographs of nooks in her beloved theatres she knew were doomed. Focused on New Empire, the series pays determined homage to Hollywood's heyday in 1950s-'70s Bombay when cinemas favoured certain distributors: Metro eponymously exhibited MGM movies, New Empire aligned with Paramount and Warner Bros till Eros exclusively screened Warner films, Strand was partial to Columbia and Excelsior to the British studio The Rank Organisation. Tracing the decline of the single screen, Maxie says, "I saw piracy in the form of videos, and then advanced tech, affect beautiful old cinemas across the country. Most were forced to shut. Those converted to multiplexes from the 1990s struggle to keep their heads above water." The imminent loss of the Modis' Elite Cinema in Calcutta, which clanged shut its gates in June, inspired Maxie to shoot there as well. "I photographed the two cinemas I still had as a record of what used to be. Later, I thought of sharing the prints with movie buffs." Deftly meshing the elegiac elements into collages, Maxie experimented with artworks of the shots in a trial and error process of sorts. Once she taught herself Photoshop and layered these, what evolved on drawing paper were mesmeric black and white abstracts — she admires mid 20th-century abstract expressionist Franz Kline. "I prefer each as a one-off artwork rather than straightforward photographs which can reprint in editions of many," she says. "I toyed with painting or drawing on them but couldn't come up with a relevant enough theme. Until the idea struck me, wandering around Empire: of using the actual marquee lettering in capitals to stencil directly on the prints." Listing studios, equipment and classic film memorabilia, Maxie pared them down to terms no more in use... RKO Pictures, Cinemascope, D-150, RCA Photophone, Westrex and Ashcraft, besides signage that glowed in theatres at various levels, like Dress Circle, Daily 3 Shows and, of course, Now Showing. She stencilled in contrasting white Conte over the black parts and in charcoal over the white. The resulting 26 frames display a different phrase overwritten on every unique composite image. 70 MM Todd AO is one such, superimposed in salute to Keki Modi's genius. Maxie says, "My father always wanted to be first with any new format or technology invented in the West. At Strand he introduced the 70 mm screen with Todd AO sound and projection." Brother Sohrab made the first Technicolor film — Jhansi ki Rani, bombing at the box office in 1953, divesting Keki of several theatres to settle debts from loans that financed it at high interest rates. And when the old Excelsior was razed, it was to be replaced by the first cinema uniquely resting on one level, without a separate Balcony. His success cemented in Bombay, Modi paid morning visits to his trio of theatres, spending afternoons at Central Studios which hosted previews. These were far more exciting than launches because films would release six long months to a year following international premieres. It was a really big deal to get to them. Regulars were an engaging mix, from filmdom's JBH Wadia and Nutan to business baron JRD Tata and movie-mad politico SK Patil who'd arrive at 9.30 pm on the dot to sink into his seat as the house lights dimmed. A charming incident is narrated about JRD watching Goodbye, Columbus, a film from 1969, year of the moon landing. When an orb flashed centre-screen, he exclaimed softly, "The moon." Only to find the shot pan out revealing the tiny "round" of a feminine navel. Another "first" Modi must doubtless have revelled, in is of Excelsior being the venue for an acclaimed French film fest in 1967. 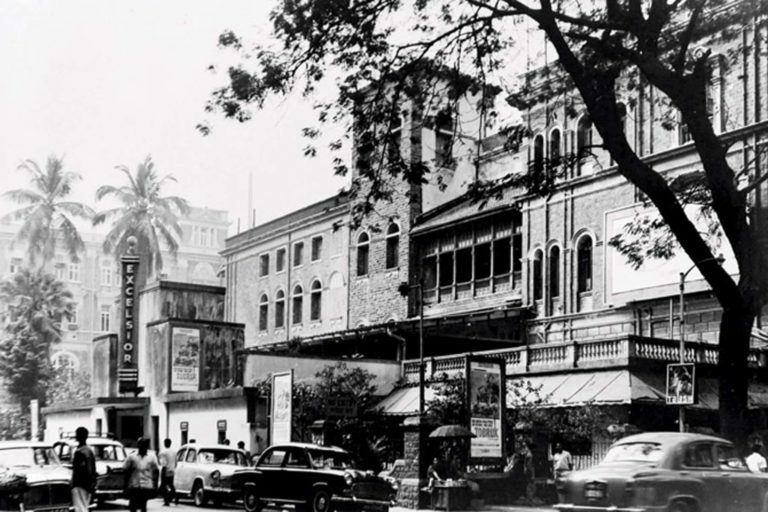 Erected by Parsi drama doyen Khurshedji Baliwala in 1887 as Novelty, to compete with Gaiety in the neighbourhood (later called Capitol), the theatre was renamed Excelsior in 1909 and New Excelsior in 1975 after Modi's demise. 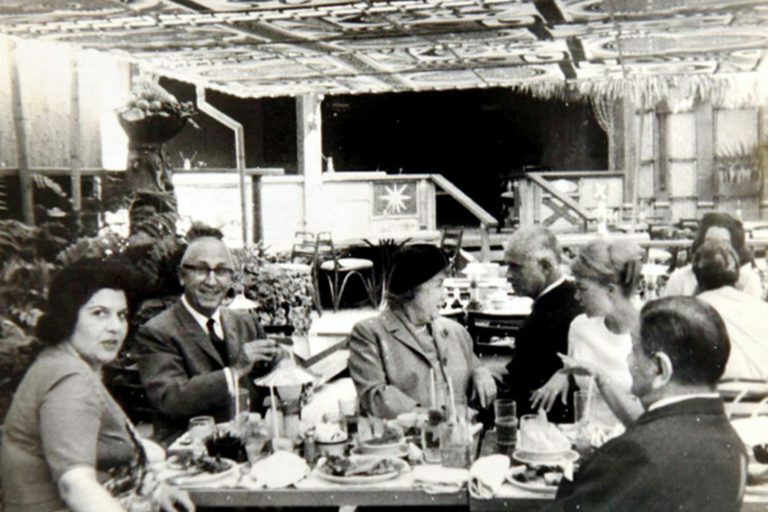 Patrons declare unforgettable Excelsior's garden cafe which served rolls, chicken broth and Bombay's very first sizzlers, supplied by the family behind Paradise Restaurant in Colaba which we just bid farewell to. 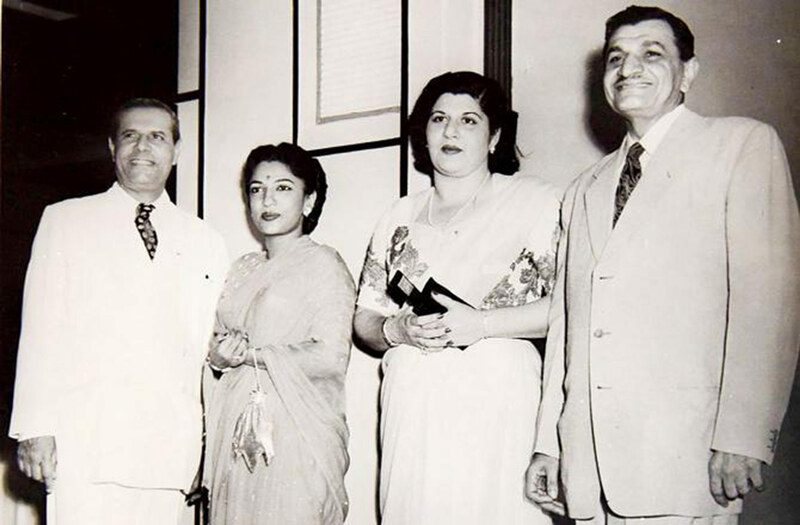 Firoz Irani, uncle of Paradise proprietor Jimmy, ran the soda fountains at the Modi theatres. "Firoz's second wife, Tachiko, was Japanese. That's how he started The Sizzler at Excelsior," Maxie says. "Jimmy took this over when Firoz and Tachiko moved to the Isle on Man." As much philanthropist as pioneer, Modi screened innumerable free shows for troops of soldiers at Excelsior. Creditably, his largesse went way beyond cinema. When grande dame Hima Devi struggled to stage Birth of Our Nation, 20 dancers rehearsing and living with her and not a paisa in her purse, she said, "Keki Modi was our saviour, a saint for the theatre world. He ensured our existence." Few know that dearly departed Strand Book Stall on PM Road started as a small kiosk inside Strand Cinema, where Westerns like Mackenna's Gold enjoyed smash hit runs. Vidya Virkar, daughter of the city's best bookseller, TN Shanbhag, said in an interview, "Though my father sought permission to set up two shelves in the lounge, Modi, touched by his passion, had these erected himself." The romance and thrill of going to the movies, when premieres were black-tie affairs attended by glamorous stars and everyone dressed smart, is a relinquished pleasure. But instead of decrepitude, Maxie's abstracts exude an assured energy." One needn't look back with sadness, we must progress," she says, greeting her Labrador who woofs answer to his macho Hollywood name, Brando. "This exhibition, with its ephemeral images tending to disappear into each other, is a metaphor for reality, which too will fade." That positivity has kept Maxie from inscribing "The End" on a single of her prints. This article was first published as a column in Mid-day on 26th August 2018 and is reproduced from there. Next PostNext Eros & Regal sound alarm. Will govt save Art Deco beauties in The End?